What prompted you to start the Fred Dolan Art Academy? I grew up in the blue-collar neighborhoods of the east Bronx. It was a world of factory workers, plumbers, and shopkeepers. But my love was for drawing and painting, and I soon came to realize that if I wanted to do those things for the rest of my life, I’d have to go to college. I managed to do just that, and eventually became a writer and illustrator of children’s books. It was during that time that a dream began rising within me – to return to the neighborhoods of my youth, find young artists there, and help them go to college. With this in mind, I created the Fred Dolan Art Academy, named after a recently departed friend. http://www.youtube.com/watch?v=hTy6rqgV9oY&feature=em-share_video_user. The Fred Dolan Art Academy is a free Saturday school whose mission is to help young Bronx artists to build their portfolios, while encouraging them to raise their grades, so that they can be accepted to college. To date, 23 students have graduated from the program, all going to college with scholarships. We’ve done this by giving the kids hope for a better future. Teaching them art has served as a bridge to academic success because they now understand that if they work on their art and raise their grade point averages, they’ll be eligible for scholarships to college. Were they kids who had interest or particular talent in art? The students who join the program are lovers of art, but we don’t require any art background or skill set to be accepted. I think that talent is overrated. I believe in commitment and passion for art (or any other field). If people work hard and diligently, there’s no reason they can’t succeed . . . And we’ve never rejected a single youngster. All we require is that they attend classes every Saturday, and work steadily while they’re with us. In most cases, our graduates choose art as a career, but some have decided to pursue other fields in college. Some are now majoring in architecture, finance, creative writing, and theatre. Do you think you’d have gotten similar results with other subjects? Yes. I think it could happen with any subject. But our expertise is in art. The academy’s teachers are all successful artists and art educators, capable of teaching the skills necessary to succeed in the art field. But our kids come from families where no one has ever gone to college. And so there’s no understanding of the importance of a college education. We’ve been doing this for 7 years now, and the data bank is growing. Every one of our 23 graduates is now in college with a scholarship. Our success is proving that hope is the most powerful tool. Without hope, there’s no reason to succeed in school. With hope, the goal of a college education becomes real, and our students have begun to realize that it’s possible to spend their lives doing what they love most. What are your thoughts about future of arts funding? Unfortunately, when school budgets drop, art and music are first to be cut. That’s a shame . . . and a concern. I’m hoping that through programs like ours, people will begin to realize that art can be a vehicle that leads to academic success, career fulfillment, and ultimately, the transformation of one’s life. Who has stepped up to the plate to help? We’ve had wonderful people offering their help and services, and we are very grateful to them. We started with a Kickstarter campaign and received donations ranging from $10 to $1500. That provided seed money for Dream Yard Press, which is our new publishing venture. Our first book, Al and Teddy, (audio book, http://www.youtube.com/watch?v=HCwJikL7BGg&feature=em-share_video_user) will be published in December. All proceeds will go to supporting the Fred Dolan Art Academy. Cornelius Van Wright, Robert Casilla, and other artists are serving as teachers there; a lawyer named Mitchell Pines has volunteered to help set us up as an independent not-for-profit corporation; Bill and Beth Johnson have donated their time writing the teacher’s guide for the book, and setting up an educational outreach program, where we’re hoping to get donations of $250 from individuals who want to gift a carton of 28 Al and Teddy books to a teacher of their choice. This all makes a big difference because we can make more profits on book sales, and use that to support our students. We’ve found that it costs about $1000/year to support each student in the program. What’s surprised you most about doing this? Everything has come together in a seemingly effortless manner. One after the other, people have continually come forward and volunteered their time and expertise. I’ve been amazed at how much they’ve done to help us further the program. What are your dreams for this project? My dream is that we can help all the kids who want to be part of the program. So far, we’ve helped 23 Bronx kids go on to some of the top colleges with full scholarships, and the schools they’ve gone to – Dartmouth, the Rhode Island School of Design, NYU, USC, SUNY Purchase, and the Art Institute of Chicago. Now, word of the program’s success has begun to spread. This year for the first time, we’ve had to turn kids away. Looking at the faces of those kids was sadder than anything I’d ever imagined So I’ve created Dream Yard Press, a not-for-profit publisher of children’s books in the Bronx. All the proceeds from sales of our books will go to the academy.”AL and TEDDY” is our first picture book. It’s the story of love and friendship between 2 brothers, and the power of art to transform their lives. I’ll attach 2 images from the book, and “A Bronx Diary,” the story of the Genesis of the academy. We’ve had articles so far in The New York Times, the New York Daily News and others in recognition of this as an important model for what can be done via arts education to make a difference. My goal is for the academy to grow. 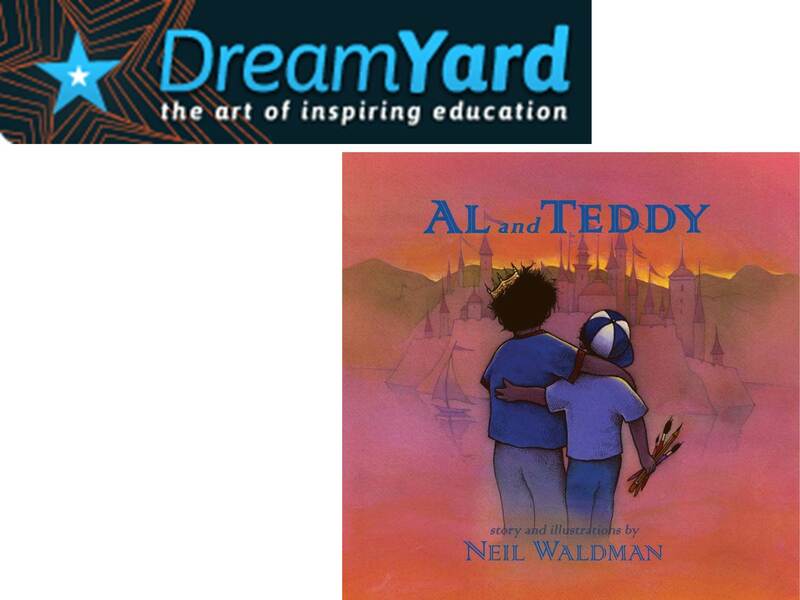 I’d love to have “AL and TEDDY” considered for awards, so we can help more and more kids. In the long run, it would be great to have our own facility, and to show what’s possible to make a difference in the lives of kids who need help breaking out of what can seem like dead-end situations. We’d welcome hearing from people who can help as teachers; in fundraising, non-profit and publishing advisors. We also particularly need help in creating an “AL and TEDDY” website. 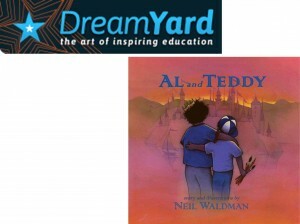 Gifting an “AL and TEDDY” book box to your favorite middle school teachers.